Editorial for first number of the Ballinrobe Chronicle - note it is signed with "The Ballinrobe Chronicle and Mayo Advertiser". 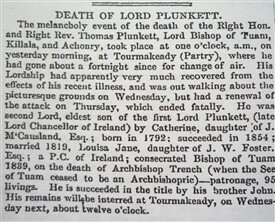 Lord Plunketts' death notice - he was involved with many evictions of the Tourmakeady community. From January 2012 we will be adding random extracts of news, events and advertisments from the paper. 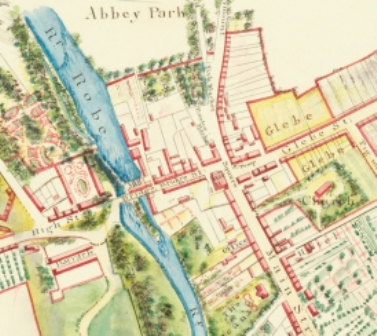 Join us to enjoy a "trip down memory lane"
Contact: myhistoricalballinrobe@gmail.com if you have any suggestions or ideas or indeed submissions which would be very welcome! 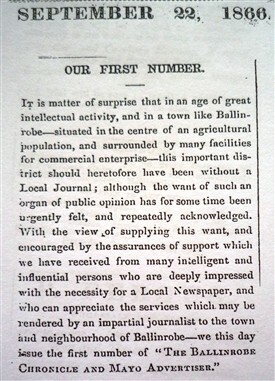 The first extract from the Ballinrobe Chronicle is the Editorial for the 22nd Sept, 1866 - see image on right. An inquest is reported on the death of a slater, 18 year old Thomas Keane, who fell 30 feet in Livingstone’s Mill Yard. The verdict mentions him falling from the roof of a "kiln". In the same issue there is a report of a girl called Mary Ward being killed as Ashford when a large scales fell on her. This page was added by Averil Staunton on 01/01/2012.